In tests measuring terminal performance through ordnance gelatin as well as ordinance gelatin with additional barriers such as heavy clothing, steel, wall board, glass and plywood, Remington Golden Saber Black Belt ammunition dominated in head-to-head competition. At the heart of the new line of ammunition is the ground-breaking Black Belt bullet—developed utilizing the stringent FBI Barrier Test Protocol for optimal performance. 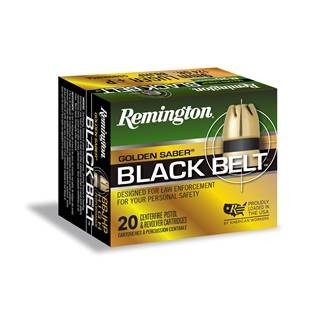 This entry was posted in Ammunition and tagged Black Belt, Golden Saber, Remington Arms. Bookmark the permalink.